We tend to think of the kitchen largely as a food preparation area alone, but oftentimes it also serves as a cleaning area at times as well. 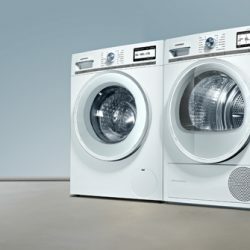 Washing machines are therefore an oft overlooked element of the kitchen, something we hope to remedy by covering a range of quality Siemens washing machines. First, as usual, we must point out that Siemens offers both free standing washing machine units, and built in washing machine options. Siemens dedication to technology that makes processes easier and more automated is in full force here, so it’s hard to know where to start. Perhaps with the fact that Siemens washing machines take up to 65% less time then many offered by competitors, by way of their speedPerfect technology. When activated, speedPerfect detects the weight of the load, the kind of textiles used, the overall temperature needed, and adjusts bleach detergent distribution and total wash time based on all these factors. Going hand in hand with this is their i-Dos functionality, which Siemens boasts is “the world’s first precision dispensing system for washing machines”. Using the same sensors as the speedPerfect technology, i-Dos measures exactly how much detergent is needed in a given wash, and dispenses it by the millimetre. This ensures that no detergent is wasted, and your clothes come out as clean as they possibly can be. Similarly, the waterPerfect Plus technology measures the exact amount of water needed for a given wash depending on weight, textile et al, ensuring a lower water bill comes at the end of the month. The stainRemoval functionality is where their washing machines truly shine, however. Selected machines can detect up to 16 types of especially stubborn stains- including Tomato, Wine, and even Grass or Mud stains- before adjusting various settings to ensure the stains are thoroughly dealt with. This leaves your clothes looking as clean as they did the day you bought them! Finally, selected Siemens washing machines include functionality that helps the machine deal with outdoor clothing and other functional clothing, ensuring that they’re treated properly during the washing cycle. Definitely an absolute boon to joggers and hikers! Whatever your need, clearly Siemens washing machines are the way to go.